The Milwaukee Latino Health Coalition is a group of people who are passionate about Latino health. We are health care professionals, social service professionals, community advocates, health promoters, community members and much more. Our Action Teams are working hard to address issues that affect the health of Latinos. By coming together, we can create the change that we want to see in our communities. It is our intention that this website be an interactive tool to begin this process. 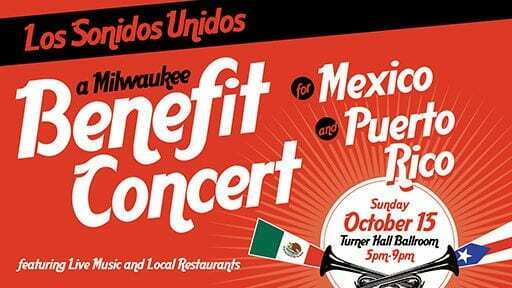 The United Community Center (UCC) and Latino Arts Strings Program in partnership with the Pabst Theater Group, the American Red Cross, and many other organizations are hosting a benefit concert for the people impacted by the hurricane and earthquakes on October 15 at the Turner Hall Ballroom from 5 PM to 9 PM. El Conquistador is hosting a resources drive in conjunction with with health fair (see below) on October 21 from 12 PM to 5 PM. MLHC October 26 General Meeting: The Milwaukee Latino Health Coalition is partnering with the Milwaukee Jewish Museum to take a look at the historical experiences of Jewish and Latino immigration and the history of immigration policy, with an emphasis on the current immigration crisis. All attendees will have a chance to tour the museum and view its current The Seventh Day exhibit. Thirty international artists explore one of the pillars of Jewish practice and belief: the sanctity of the Sabbath through provocative works of art. The Seventh Day explores how the Sabbath is observed from a perspective of diversity including various religious traditions, mindfulness practices, and the back to nature movement. Please RSVP today! We look forward to seeing you on October 26! Reminder – MLHC Member Survey closes on October 13: Individuals who have participated in MLHC activities during the past 2 years were invited to participate in the survey. If you received an invitation, please take a few minutes to share your opinions regarding MLHC’s structure, function, and effectiveness. The results of this anonymous survey will be used to help evaluate MLHC, identify areas for improvement, and support ongoing strategic planning. Open Enrollment for the Health Insurance Marketplace is November 1 through December 15: Many of us may know someone who does not have health insurance and there has been a good amount of mixed information regarding the state of the Patient Protection and Affordable Care (also known as Obamacare), but it is still law of the land and there are still many free, local enrollment assisters that can help people navigate their health insurance options through the state’s Medicaid program, BadgerCare Plus, or the Health Insurance Marketplace, healthcare.gov (Spanish: cuidadodesalud.gov). Many people will qualify for financial help to lower their monthly cost of health insurance. For people who have health insurance questions, dial 2-1-1 or text your zip code to 898-211 to find free, local help. National Latino AIDS Awareness Day is October 15: Find out about local events and HIV testing locations here. There are more campaign and awareness materials for National Latino AIDS Awareness Day on their website. Touched Twice Lake Country Free Health Clinic: This event will be held on Saturday, October 14th from 9:00a to 1:00p at Oakwood Church in Hartland, WI and is open to the public. There will be a variety of services including medical, chiropractic, dental, and vision. Flu vaccines will be offered thanks to the support of Froedtert & the Medical College of Wisconsin. Legal assistance, job search counseling, and other support services will also be available. Spanish interpreters will be available for assistance. For more information visit Touched Twice Lake Clinic Free Clinic. Alverno Interpreter Institute Fall 2017 Workshop: The topic will be “Immigration and Healthcare Reform: What does it mean for language services?” Attend the Alverno Interpreter Institute on Saturday, October 21st at Alverno College in Milwaukee, Wisconsin. Reserve your seat today – the early-bird registration rate for this event will end on October 12, 2017! Register here. Latino Family Expo: El Conquistador is hosting a family expo and health fair on October 21 and 22 at St. Anthony’s High School. Learn more about the event on their Facebook page. For all of October’s events and more, please follow the MLHC on Facebook for regular updates! Stay safe and have a lovely October. Vision: A Latino community with access to equitable and culturally appropriate healthcare services and resources which foster health and well-being. Mission: The Milwaukee Latino Health Coalition is a collaboration of individuals and organizations dedicated to promoting health and wellness, reducing health disparities, eliminating stigma, and striving for social justice through education, advocacy, research, and sharing of resources. Please read this month’s Chair’s Corner to see the MLHC is working on and highlighting this month.